Warm vanilla with deep notes of maple, our pudding-like créme has all the nuances of fall. The crispy, sweet and salty bacon adds a perfect contrast with its candied perfection. Top it off with sweetened whipped cream and crushed Nilla wafers. 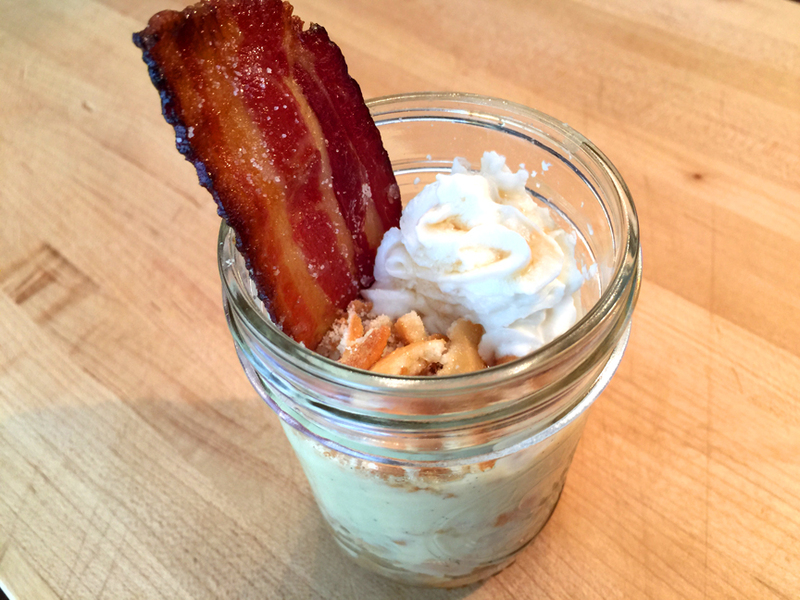 We like using ball jars to show off the layers and candied bacon. Line a baking sheet with foil. Place a cooling rack on the baking sheet. Lay the bacon on the rack. Using ¼ cup of maple syrup, baste one side with the maple syrup and sprinkle with 1 tablespoon maple or brown sugar. Bake for 15 minutes. Remove from the oven, turn the bacon over, brush the second side with ¼ cup maple syrup and top with 1 tablespoon maple or brown sugar. Bake for 15 more minutes. Remove immediately and place on a parchment lined plate to cool completely. Fill a large bowl with ice cubes, place smaller metal bowl inside and set aside. Bring milk and vanilla bean pulp to a simmer. Remove from heat and set aside. Whisk yolks, sugar, and cornstarch together in a heavy-bottomed saucepan. Whisking constantly, very slowly drizzle in ½ cup hot milk. Add the rest of the milk in slow steady stream. Increase the heat to medium and whisking vigorously, bring mixture to boil. Cook the mixture until it is extremely thick and looks like pudding, about 10-15 minutes. Remove from the heat and stir in the butter. Pour into the bowl set over ice to cool completely, then refrigerate until very cold. To assemble: In the bottom of six ball jars, or tall dishes, place the crumbled Nilla wafers evenly. Layer with one layer of pudding, then a thin layer of maple syrup. Follow by another layer of pudding, then top with whipped cream and a couple crumbled mini Nilla wafers. Keep cool; when ready to serve slide one piece of candied bacon down the side of each ball jar or dish of layered maple créme.